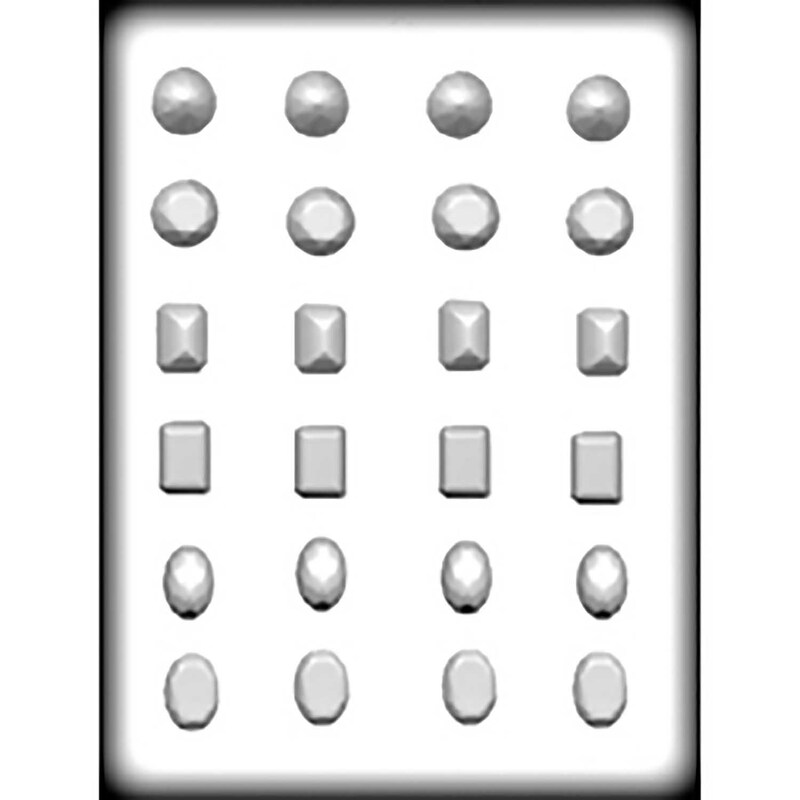 Oval: ¾" wide x 1" long x ⅛” deep Create assorted jewels in this hard candy mold. White plastic withstand heat, which makes these molds ideal for cookies, hard candy, chocolate, candle wax and more. These CK white hard candy/cookie molds withstand heat up to 375 degrees. For cookies: Make a good roll-out cookie dough. Spray hard candy mold cavities with cooking spray. Push dough into mold cavities and place cookie filled molds on an aluminum cookie sheet. Bake on top rack at 325 degrees for 8-10 minutes. Cool slightly before removing cookies from molds. For gorgeous sparkling jewels, make hard candy: Spray hard candy mold with cooking spray. Make a batch of hard candy using CK Hard Candy Mix #75-4301, following directions on package. Pour hot syrup into sprayed funnel with stopper covering hole. Slightly lift stopper to let proper amount of hot syrup flow into sprayed cavities of mold. Let cool to room temperature. When syrup cools and candy is hard, release candy from mold. Create assorted jewels in this hard candy mold. White plastic withstand heat, which makes these molds ideal for cookies, hard candy, chocolate, candle wax and more. These CK white hard candy/cookie molds withstand heat up to 375 degrees. For cookies: Make a good roll-out cookie dough. Spray hard candy mold cavities with cooking spray. Push dough into mold cavities and place cookie filled molds on an aluminum cookie sheet. Bake on top rack at 325 degrees for 8-10 minutes. Cool slightly before removing cookies from molds. For gorgeous sparkling jewels, make hard candy: Spray hard candy mold with cooking spray. Make a batch of hard candy using CK Hard Candy Mix #75-4301, following directions on package. Pour hot syrup into sprayed funnel with stopper covering hole. Slightly lift stopper to let proper amount of hot syrup flow into sprayed cavities of mold. Let cool to room temperature. When syrup cools and candy is hard, release candy from mold.